Bolt Buddy is another door Patented door renforcemant product we offer to strengthen and protect the weakness of the door jamb which usually breaks when you kick the door. This is a revolutionary product that reduces the burglar's ability to gain access to your home by kicking and prying the door which is a standard way for them to break into your home. The Bolt Buddy system acts much like a vice. It is comprised of two steel bracket system which is bolted from the inside and outside of the door jamb of your home. Acting like a steel shop vice, the Bolt Buddy equalizing the stress of an attack from an intruder to the entire door and door frame, which makes it harder for the door to split and allow access for the intruder. The Bolt Buddy has a security message inscribed right on the door to act as a visual diterrent and really a warning of not to mess with this house. 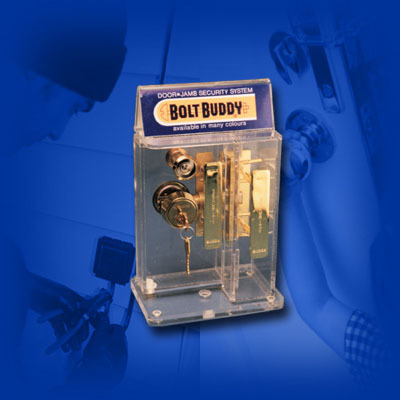 The Bolt Buddy can be installed on most doors by Pre-Lock Security Services. We recommend also installing a high security deadbolt like Medeco or Mul-T-Lock to provide additional security which you will not have with a standard deadbolt.